The K3VG Series Swash Plate Type Axial Piston Pumps are designed to specifically satisfy the industrial open circuit market where noise, efficiency, controllability and extended pump life are considered to be essential. 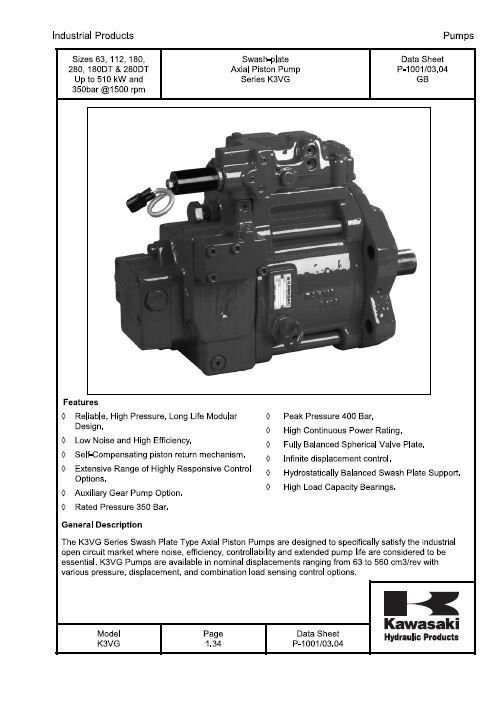 K3VG Pumps are available in nominal displacements ranging from 63 to 560 cm3/rev with various pressure, displacement, and combination load sensing control options. Reliable, High Pressure, Long Life Modular Design. Extensive Range of Highly Responsive Control Options. Fully Balanced Spherical Valve Plate. Hydro-statically Balanced Swash Plate Support.